Available in mid-January 2017, the boxed set includes all 14 compositions first released in 2012-13 … now at a special price of four CDs for the price of two. Several years ago, the Grand Piano label issued a series of four CDs that together make up the complete original works for piano duet and duo by the French composer Florent Schmitt. Consisting of 14 opus numbers created relatively early in Schmitt’s long composing career (the works were completed between the years of 1899 and 1916), this body of work represents an important contribution to the piano repertoire. The classic Robert and Gaby Casadesus Columbia Masterworks recording of two of Florent Schmitt’s duo-pianist scores (1956). … And yet for many years, most of these pieces lay barely touched, with only a few of them performed and recorded. 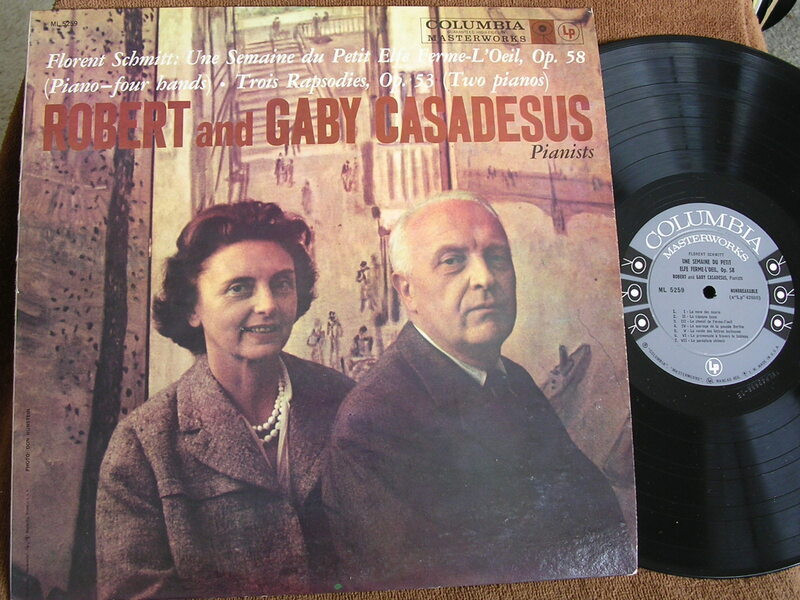 Among the fortunate pieces that were better-known were two sets championed by the famous French piano duo Robert and Gaby Casadesus — Une semaine du petit-elfe Ferme-l’oeil, Op. 58 and Trois rapsodies, Op. 53. The Casadesus team recorded both works for Columbia Masterworks in 1956 — classic readings which remain available today. 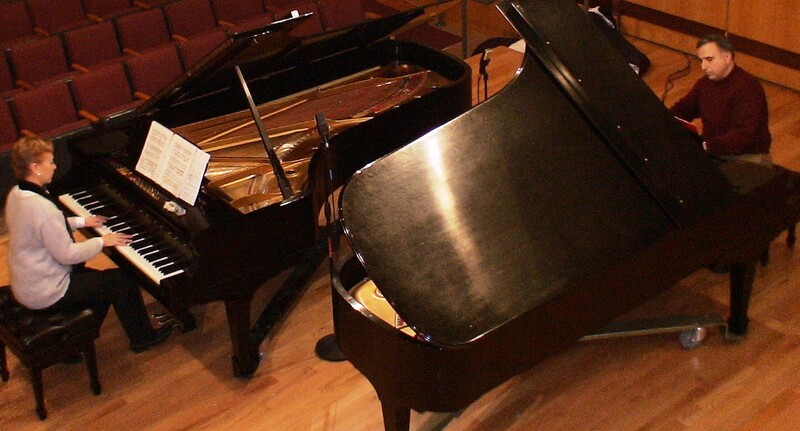 The four disks were released by Grand Piano in 2012 and 2013. I wrote about the project at the time, including an insightful interview with the two pianists. To give you a flavor of the inventiveness of Schmitt’s piano music — as well as the fresh and invigorating approach by the Invencia Piano Duo, you can see and hear pianists Kasparov and Lutsyshyn performing Schmitt’s brilliant Rhapsodie parisienne in recital in 2011, via this YouTube clip. 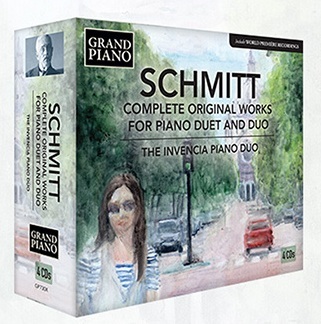 And now, three years after the release of the fourth and final volume of Schmitt’s complete music for piano duet and duo, Grand Piano has announced that it will be releasing the entire 4-CD series as a boxed set (label catalogue number GP730X). It will be available worldwide beginning in mid-January. Even better, the boxed set is being offered with special pricing: four CDs for the price of two. 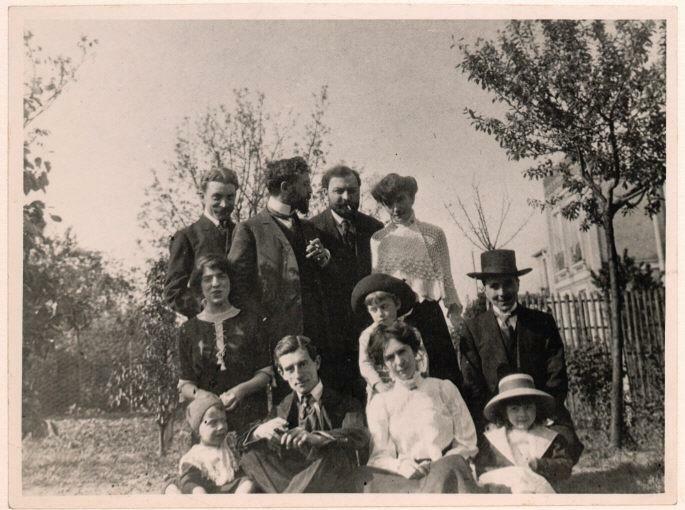 Devotees of Florent Schmitt’s music — as well as anyone who loves piano music in general — now have the opportunity to acquire these artistically important recordings at a bargain price. As it is impossible to know how long the set will be available at such a lucrative price, I recommend that you act quickly to take advantage of this special offer. The set is now available for pre-order at Amazon’s USA site, and soon at other online classical music vendors including Arkiv Music, HBDirect, Presto Classical and Amazon’s UK site. This entry was posted in Classical Music, Composers, French Composers, Piano Four-Hand Music, Piano Music and tagged Andrey Kasparov, Audiophile Audition, Burkhard Schafer, Casadesus, Classica, Florent Schmitt, French Composers, Gaby Casadesus, Gary Lemco, Grand Piano, Invencia Piano Duo, Michel Fleury, MusicWeb International, NAXOS, Oksana Lutsyshyn, Piano Duet, Piano Duo, Piano Music, Piano News, Robert Casadesus, Schmitt, William Kreindler. Bookmark the permalink. « Experiencing Florent Schmitt’s Antony & Cleopatra (1920) in a dramatic adaptation: An eyewitness report from London.